I first covered the U.S. Department of Homeland Security’s (DHS) involvement in “hurricane mitigation” efforts back in 2013. I was talking to geoengineer Stephen Salter when he offered to let me browse his FTP server with all of his research files. Talk about transparency, thank you doctor Salter. I found a folder labeled “Hurricanes” on his server and in it was the DHS workshop presentation Word document. The meeting covers efforts to avoid repeating the monetary and physical loss associated with the 2005 disaster, Hurricane Katrina. The DHS’s involvement with hurricane modification coincides with several patent applications bearing the names of several prominent geoengineering enthusiasts: Bill Gates, Ken Caldeira, Stephen Salter, and John Latham. Also on the series of hurricane mitigation patents is Nathan “patent troll” Myhrvold, Lowell Wood Jr. and Roderick Hyde of “Teller, Wood, and Hyde” fame. This motley crew apparently attended Bill Gates’ New Years Eve party and came up with a whole bunch of ideas for steering or making money off of hurricanes. The goal is not to stop hurricanes, which are an important part of the natural cycle, but to mitigate damage to life and property. Every major hurricane since Katrina has been hacked by the DHS! On October 4th, 2016 it was looking like Hurricane Sandy all over again. It's October, it's an election year, there's a hurricane headed for New York up the east coast. Too many coincidences. 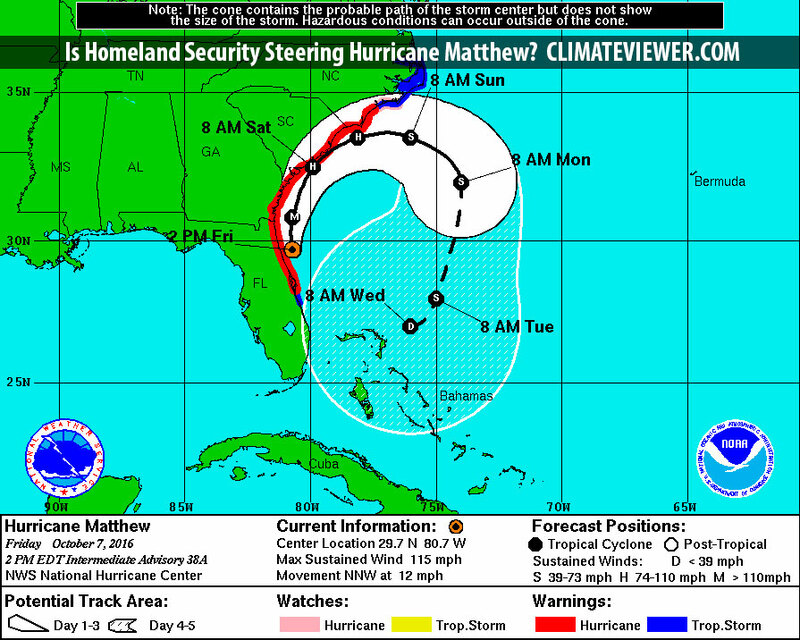 Then suddenly the next day, out of nowhere, Hurricane Matthew is headed out to sea! But wait, it gets weirder! It looks like Hurricane Matthew is coming back! The question I have is this: "Are they just showing off, being nefarious, or is history repeating itself? The fact remains, within six hours of seeding this hurricane it made a 120 degree turn and killed people. 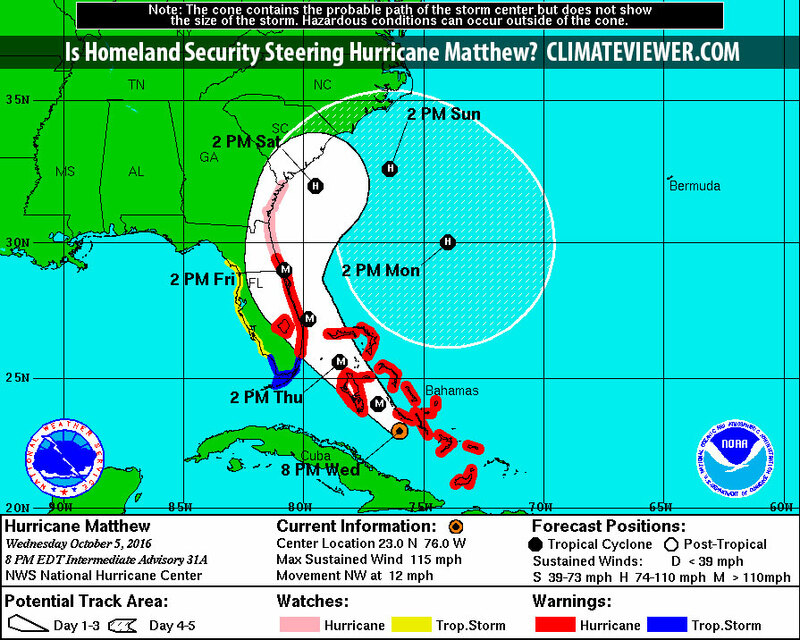 Now that Hurricane Matthew is supposed to hit my house Saturday morning, then swing back around and possibly do it again, I really hope we can get the DHS to learn from the past: If you modify a hurricane you own the consequences. Track Hurricane Matthew and all the DHS storm steering live with ClimateViewer 3D! 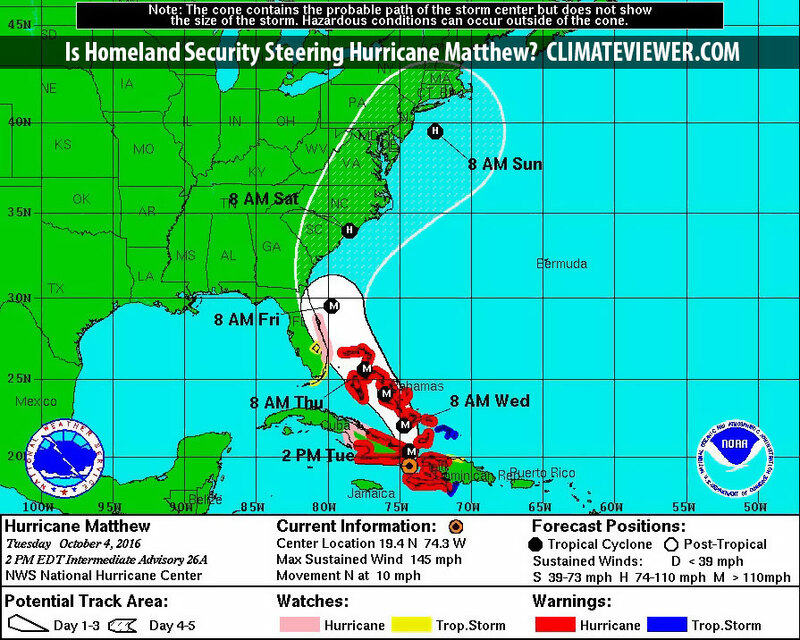 Is Homeland Security Steering Hurricane Matthew? by Jim Lee is licensed under a Creative Commons Attribution-NonCommercial-ShareAlike 4.0 International License. Based on a work at climateviewer.com/. Permissions beyond the scope of this license may be available at climateviewer.com/terms.